It’s almost mid-November, and upcoming releases have now ventured out into the 2011 collective. In 2010, more than any other year since I’ve been writing Letters From A Tapehead, there seems to be an honest and prodigious influx of music informed by jazz fusion Miles Davis and the worldly futuristic vision of Sun Ra in a musicscape understood to be post-everything. Indie rock, revived No Wave and progressive metal to some extent have seemingly acted as the base for a lot of this music: Mi Ami, Floored By Four, Sax Ruins, Shining, Marnie Stern, Swans, Maus Haus, Aluk Todolo, Zu and Zach Hill to name a few I’m sure, bands and performers unattached to formal rhythms and mostly unbound by orthodox, pop rock assembly. These bands seem more susceptible to improvisation or, at the very least, improvised cycles wherein elements are layered to create sonic madness atop a persistent foundation. Though there has been a wave of wildly percussive arrhythmia for some time, (most notably the various projects of Mike Patton and John Zorn, The Dillinger Escape Plan, Converge, Melt Banana, there is quite a list), this music does seem at somewhat of a forefront now, at least in terms of how visible independent music tends to be. Or, it could just be that I’m finding it easier. Anyway, now that I’ve blown this up, I heard a song today by Beep and, coupled with Chris Schlarb track I posted last Friday, not to mention some of the more avant-garde picks I’ve compiled for my “Best Of 2010” list, from where I’ve been observing there’s a surge of creativity that appears to be finding more of an audience. It could be labels are finally willing to throw money toward talented musicians and performers, it could be musicians are able to take more risks, it could be an overall dissatisfaction with the monotonous acts/bands that seem to win hipster hearts... Maybe independent music has just grown tired of compromise, choosing instead to resolve the issue with protest, swimming upstream and allowing the path of least resistance to continue toward the waterfall. 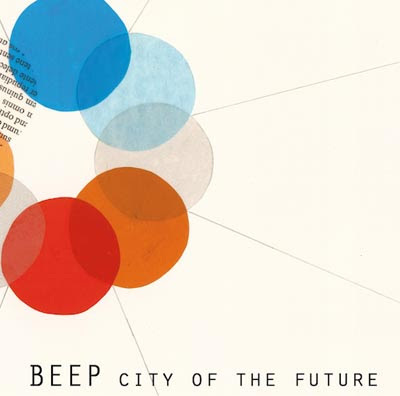 Beep is a San Francisco trio formed from members of Tune-Yards, and their song “Wolf Pantalones” is the first single from their upcoming release, City Of The Future. Give the song a listen and hear for yourself if we’re standing at the precipice of something... I don’t know... Just something, I guess. The album will be out January 18th, 2011 on Third Culture Records. BEEP bounds in fields of abstract flowers. Mischievous, mysterious, intricate and teasing: Children's songs on painted pages. Fairy tales intone in an unsettling, hopeful voice. Planes of sound overlaid and overlapping. Landscapes unfold under storms of pastel-shaped jazz. Melodies emerge and recede, twist and flow. Rhythms like water spiders, skating over possibilities. Points of convergence slide and dissolve, reconfigure and drift. Charting the edges of traveled territory; bringing back artifacts from faraway lands, communications from distant planets. Stalwarts of the Bay Area music scene, BEEP have honed their interests in diverse projects spanning indie rock, free jazz, and the avant-garde fringe, evolving into the Bay Area's most alluring purveyor of experimental eclectism. Their upcoming release, City of the Future (on Third Culture Records) was recorded with Eli Crews [Deerhoof, Why?] at New, Improved Recording in Oakland. BEEP also invited the most compelling singer they know, Tune-yards' Merrill Garbus, to grace a few tracks. Her jaw dropping vocals on "Wolf Pantalones" and "Mbira" provide transcendent passages to already insane music. While not a concept album, the music on City of the Future is conceptual: the group had a certain sound world in mind throughout-acoustic and uncommon instruments, carefully constructed electronic sounds, strange or subverted musical forms-that would inveigle the listener to enter a tweaked reality juxtaposing chaos and beauty, familiar and bizarre, the serene and the catastrophic. What emerged was a futuristic soundscape with the warmth and familiarity of an earlier era in recording technology, an album evoking Sun Ra, Sly and the Family Stone, electric Miles, as well as skyscrapers, flying cars, flashing lights, cyborg animals, holographic warlords, and space exploration.